1. 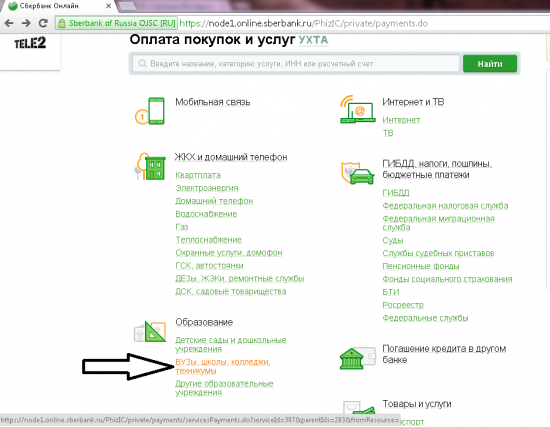 Log in the Sberbank Online system at: https://online.sberbank.ru/ and enter your user name and password. 2. 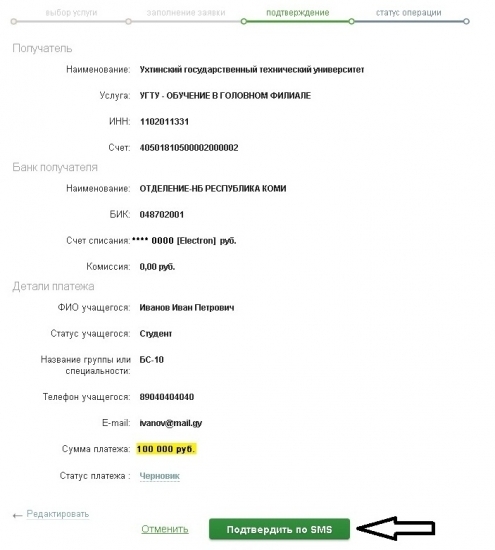 In the section "ПЛАТЕЖИ И ПЕРЕВОДЫ" >> "ОПЛАТА ПОКУПОК И УСЛУГ" click on "ОБРАЗОВАНИЕ" >> "ВУЗЫ, ШКОЛЫ, КОЛЛЕДЖИ, ТЕХНИКУМЫ"
3. 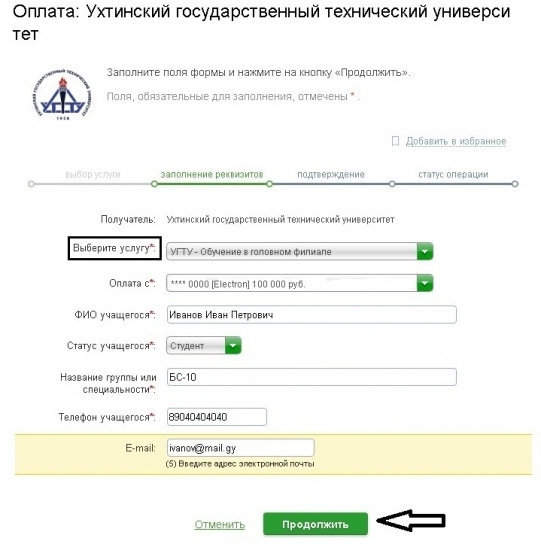 Then choose "Ухтинский государственный технический университет"
4. 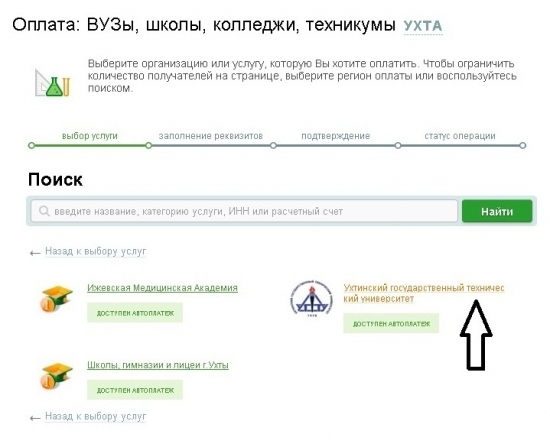 In the list "ВЫБЕРИТЕ УСЛУГУ" find "УГТУ - Обучение в головном филиале" and choose it. 5. 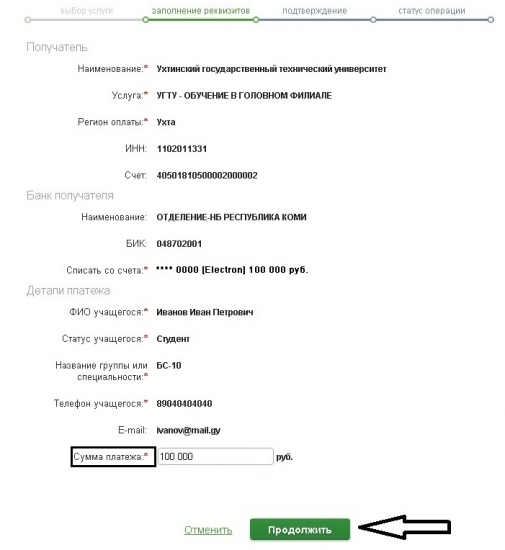 Check payments details and in the space "СУММА ПЛАТЕЖА" enter the amount of money you are going to charge. 6. After that you need to press on "ПОДТВЕРДИТЬ ПО СМС" button, and within a minute you will receive a message with a password on your cell phone. 7. 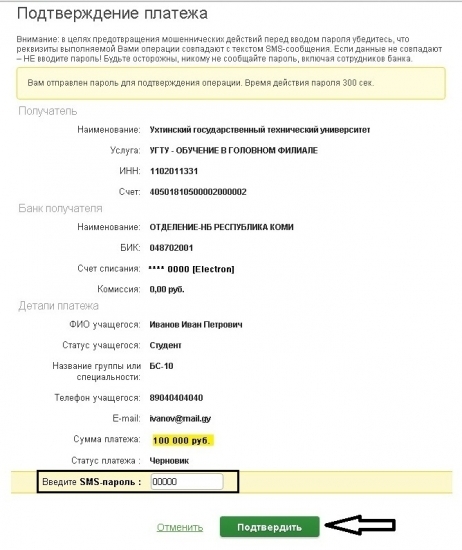 Enter the SMS-password and click on "ПОДТВЕРДИТЬ". Now the payment is complete!